As more Canadians than ever before are exploring the private capital markets for investment opportunities, a home-grown approach is reshaping the venture finance and investing landscape in this country and providing investors and companies with exciting and new opportunities. Through the private markets, start-up companies have greater access to capital to fuel their businesses and everyday Canadians have an opportunity to invest in these issuers at an early stage in their development. As these companies work to grow and succeed, they may have an opportunity to reach an even wider group of investors through the public markets; the Toronto Stock Exchange (TMX), the Toronto Venture Exchange (TSX-V), or the Canadian Stock Exchange (CSE) to name a few. Traditionally, only a small group has had access to investing in startups and growth companies: angel investors and venture capital firms. The wider investor community was virtually locked out from investing in emerging companies. Only once a company went public (if it was not already acquired by another company) could the public invest. At FrontFundr, we saw the inequity in this. Why should the public —the customers who made a company successful in the first place —be locked out of investing until the most significant gains have already been made? Since 2015, we’ve pioneered the democratization of funding and investing in startups and growth companies in Canada, enabling all Canadians to invest in early stage companies through investment crowdfunding. We estimate the additional capital pool made available by opening up the private capital markets to be around $2.5 billion per year. As the marketplace and securities regulators build confidence in this new capital market, investment crowdfunding is poised to become mainstream, like in the U.K. where investment crowdfunding has been around since 2010. UK Companies raised £333 million in 2017 and £53.8 million in the first quarter of 2018 alone. This is where the new reality of venture finance and investing gets even more interesting for Canada: liquidity can be achieved by leveraging the country’s existing venture exchanges, the biggest ones being TSX-V and the CSE. These exchanges found their origin in Canada’s mining industry but have evolved into diversified public marketplaces representing a variety of industry sectors. Venture exchanges may enable private companies that raise capital through investment crowdfunding to create liquidity for their shareholders and an opportunity to gain access to potential growth financing. 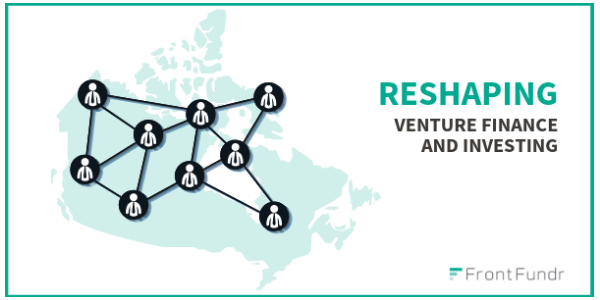 A recent example of this is RE Royalties LTD(TSX-V: RE), a company that raised capital on FrontFundr in 2018 and is now trading publicly. Moving through an online platform like FrontFundr and on to a venture exchange is a logical progression between the private and public markets; and increases the possibility of liquidity for investors in the future. It’s time for Canada to take the lead in shaping the new reality of venture financing and investing and we’re up for the challenge.